Whisk up a batch of Siúcra’s chocolate-dipped meringues. These tasty little bites are light and airy and are dipped in melted chocolate and chopped nuts for a sweet and salty flavour combination. Set the oven temperature to 125°C. Combine the egg whites, granulated sugar, and brown sugar in a stainless steel pan. Place the pan in a water bath (over boiling water ). Whisk by hand until the sugar crystals have dissolved. Check by rubbing the egg white mixture between the fingers; it must be completely smooth. Remove the pan from the water bath and whisk the meringue using an electric whisk on high speed until it has cooled. Add the icing sugar while whisking. Divide the mixture into two and flavour one half with cognac and the other with peppermint. Pipe into small peaks on a parchment-lined baking sheet. Bake in the oven for 2-3 hours or until the meringues are dry. 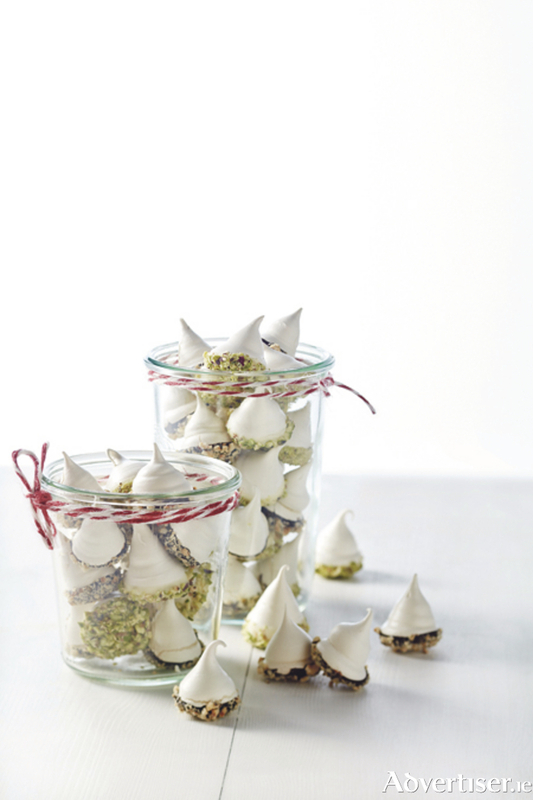 Dip the cognac meringues in white chocolate and chopped pistachios. Dip the mint meringues in dark chocolate and chopped roasted hazelnuts.